The Next Day is out via Columbia. Check the flow. 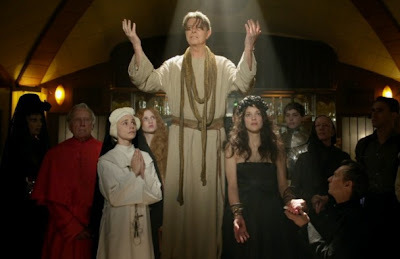 David Bowie has released the third video from his album "The Next Day," writing, conceiving and starring in a clip for the album's title track. Floria Sigismundi, the photographer and filmmaker who wrote and directed "The Runaways" and directed Justin Timberlake's "Mirrors," directed the Bowie film. She also directed the last Bowie video, "The Stars (Are Out Tonight)," which featured Tilda Swinton. Gary Oldman and Marion Cotillard, who won the Academy Award for her portrayal of Edith Piaf, co-star in the video, which takes place in a pub with a cast of characters straight out of Vatican City. Oldman portrays a priest who at one point condemns the Christ-like Bowie, the frontman in the band playing at the bar. There's also a Cardinal handing out cash, a praying nun and a saintly character played by Cotillard. Oldman and Bowie worked together previously on 1996's "Basquiat" with Bowie portraying Andy Warhol and Oldman in the role of fellow painter, Julian Schnabel. Both men sang on a 1995 solo album from Reeves Gabrels, a member of Bowie's Tin Machine, titled "The Sacred Squall of Now."